After he pitches only two innings, lefthander and Mickey Callaway say that there are no lingering health issues. 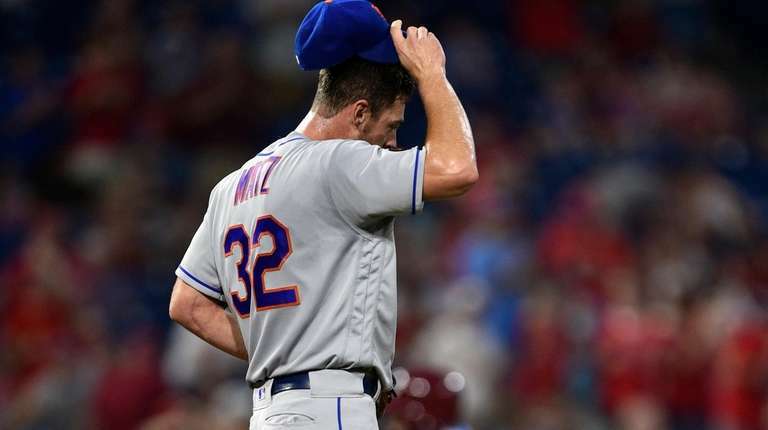 PHILADELPHIA — After Steven Matz’s return from the disabled list went about as poorly as the starts before it, the lefthander and manager Mickey Callaway attributed it to rust after the two-week layoff, insisting there were not any lingering health issues. The Phillies roughed Matz up for six runs (four earned) in two innings in the Mets’ 9-6 loss in Game 2 of Thursday's doubleheader. He allowed five hits and a walk and struck out two, throwing only 58 pitches (31 strikes) — well short of the 75-80 limit Callaway prescribed heading into the game. Matz wanted a third inning, Callaway said. But the Mets opted for Paul Sewald. Matz has had a rough second half. In four starts, he has a 13.18 ERA, a figure swayed heavily by his two-out, seven-run outing July 31. After that, Matz landed on the DL with a flexor pronator strain in his left elbow. That kept him out until Thursday. Callaway and Matz were confident that a regular schedule and some work with pitching coach Dave Eiland would solve his issues. Mets score franchise-record 24 in laugher vs. PhilliesThe win came on the heels of a 16-run, 19-hit night Wednesday against the Orioles, the first time in franchise history the Mets scored more than 15 runs in consecutive games.